This roadlog and driving map from the Texas border to Veracruz to Yucatan on the Mexican Gulf Coast is for drivers who want to know more than driving distances. 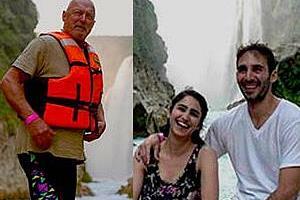 It is incorporated into the road log from the Texas border to Acayucan. 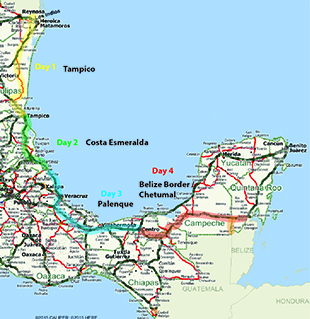 The Mexican Gulf Coast map below map is a combination of a road map and road log or roadlog, with interesting facts and places to visit throughout Veracruz. 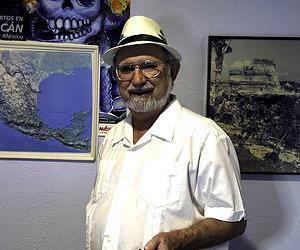 For example, you might drive past the exit for Tuxpam (also spelled Tuxpan), Veracruz without knowing that it was here that Fidel Castro launched his boat Granma and sailed on to Cuba to launch his successful revolution. Unless you are a Fidel aficionado, Tuxpan has little to offer tourists. Keep driving. The Tampico bypass inset map will save you time and aggravation. You get that with the roadlog - any crossing except Laredo to Yucatan. If driving to Belize or Guatemala as a transmigrante, you have to go this way. If you don't know what a transmigrante is, look at the description in my store. If you are interested in psychic energy areas of the Mexican Gulf Coast, the state of Veracruz has many. I've noted some areas of psychic energy on this map of Veracruz state. There are brujas, but not just where you think, like Catemaco, but in Santiago Tuxtla (near San Andres Tuxtla and Catemaco) and Papantla, near El Tajin archeology ruins. Naturally, hot springs or mineral water springs are indicated. San Andres Tuxtla is the cigar capital of Mexico and Papantla is the vanilla capital of Mexico. Of course the mundane things like RV parks, drive times, driving distances and toll roads are included. Added to this is my knowledge of driving Mexico, so I tell you how to get out of Tampico and which shortcuts to take and to avoid. This Mexico map explains why to visit Jalapa (also spelled Xalapa) Veracruz. There is a hot spring, Carrizal aguas termales on the road to Xalapa, Veracruz.